For all IBOs, it’s a pleasure to learn the origin and background of the Independent Business Owners Association International (IBOAI®†). This year, IBO Leaders were treated to an informative session at Diamond Club on the history of the IBOAI®† by Legacy Diamond and IBOAI®† Governance & Oversight Chairman, Jody Victor. In 1994, an important and enduring partnership was established between Amway and the Board, sharing with the Board for discussion, evaluation, and recommendation all proposed new policies and/or proposed policy changes that may materially affect the Amway North American Distributor organizations. In 2007, it was updated to change wording of distributor to Independent Business Owner. 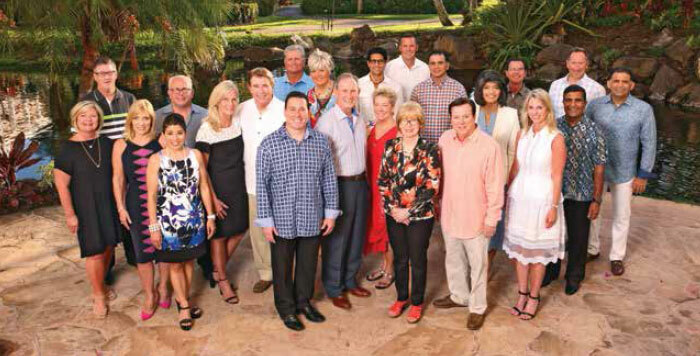 A powerful partnership between Amway and the IBOAI®† Board is evidenced in the collaborative work on the IBO Rules of Conduct, Compensation Plan, recognition events, and the upcoming Amway 60th (A60) celebration planning. With great pride, Jody also spoke of the structure of the IBOAI®† – the committees, including the Marketing Advisory Committee, support staff, and ongoing partnership with the Corporation. “I am in awe of how these people work tirelessly on behalf of all IBOs,” remarked Jody. Closing the meeting with a Q&A proved to be lively and fun. There were some great questions and wonderful memories, stories, and expressions of gratitude shared by IBO Leaders, many of them former IBOAI®† Board members. (above) The IBOAI®† Board convenes at Diamond Club 2017.